When designing a restaurant space, it is important to install tile that is durable, inexpensive, and pleasing to the eye. One of the best options that satisfies these three needs is cement tiling. 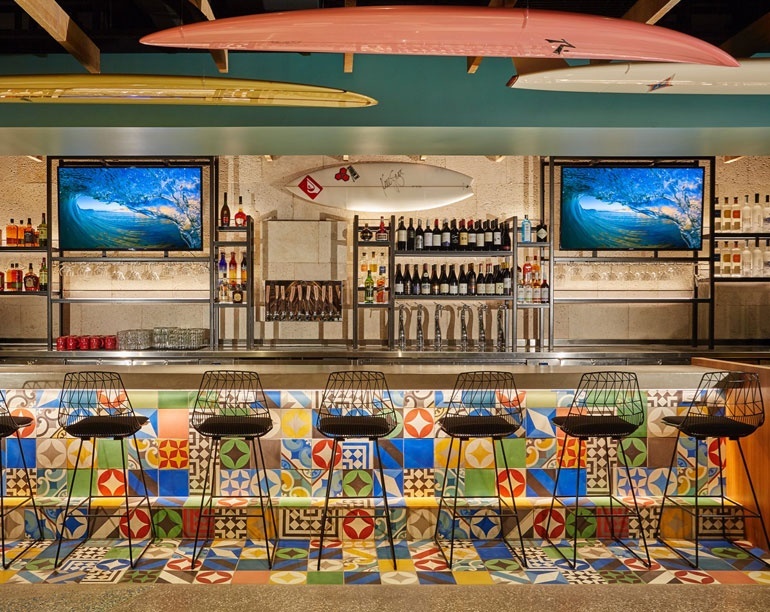 Whether as a backsplash behind the bar, as the featured design on the walls, or as flooring, cement tile’s versatility is functional and beautiful. Painting or staining cement floor helps keep it protected which also means designers can create charming, rustic, or unique design choices with to elevate the look of a restaurant. Because of the myriad of staining and painting options available to designers, cement tile allows one to be as creative as their imagination allows. 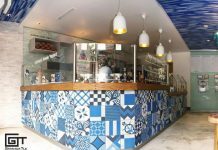 Cement tile not only allows one to create a faux stone look or Persian-inspired arabesque designs, it also can take the form of three dimensional shapes, giving your restaurant kitchen a custom look, ranging from high-modern to pueblo rustic looks. Because of their versatility, cement floors and walls are seen more often in restaurants, making it the hot new trend. As long as cement tile is sealed well initially and then regularly resealed, it will hold up well to high traffic, in addition to wear and tear. Below are five creative ways restaurants can use cement tiles to create an interesting space. By using geometrical patterns, restaurants can create depth in their space, making it look bigger than it actually is. This gives diners the feeling that they have more room to eat. Designers can utilize a simple black and white, interlocking pattern to set the tone at the entry way. This tile pattern acts as a beautiful welcome mat to not only invite diners in to eat, but sets the tone for the dining experience as calm and organized. 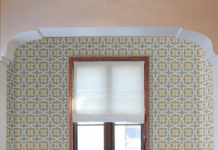 Designers can also create larger patterns by separating a set of smaller tile patterns within another pattern. This gives the area where the smaller pattern is located the feel of an area rug, but without the kitsch. Of course, geometrical patterns also lend themselves well to brasserie-like establishments, giving the restaurant that je ne sais quoi of French food. For upscale Southwest restaurants, it is best to match the decor with the cuisine which is typically rustic and full of flavor. The best way to accomplish this is through cement tile that looks as though it were hand painted with flourishes that look like kaleidoscopic patterns. Using rich, reddish earth tones accented by blues and yellows is the optimal way to achieve this look. Designers can also use hexagonal tiles stained to look like stone as the flooring, reminding diners of the Southwest. 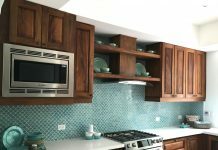 These options not only create a beautiful and charming space, but are also much less expensive than the traditional stone or hand painted tiles typically found in the palatial Mexican homes that inspire this look. A great way for upscale restaurants to achieve a bold, dynamic look is through three dimensional design. By adding texture to the walls, avant-garde dining establishments can use three dimensional shapes to mimic the artistic plating of their food. This also gives the restaurant a unique look to imbue the dining experience with design and aesthetic. Designers can also use a variety of colors to shape the tone of the restaurant. If the restaurant takes over an older space, such as an restored warehouse or Victorian home, the interior three dimensional tile will starkly contrast with the exterior, giving the space personality beyond the imagination. One of the most popular stenciled designs found on cement tile is the flourish and fluid arabesque. This shape provides a pop of shape in an otherwise simple enclosure, but it can also be combined with other colored arabesque designs to create a warm, homelike space that imbibes the diner with pattern and color to match the flavorful dining experience found in Middle Eastern and Indian cuisine. By giving shape to the restaurant, the cement tile also shapes the dining experience to be one of joy and comfort. Coffee shops and cafes have typically been known as cozy, close spaces adorned with overstuffed couches and chairs. This has changed over the past decade with new, third wave cafes and coffee shops ditching the stuffy 90s look and opting for minimalist spaces. With white or neutral, monochromatic walls setting the tone, and sleek, linear chairs being the prime option for seating, designers can add tasteful flair to the space by using fluid and floral patterned cement tiles in black and white will offset the starkness and create and inviting backdrop, especially when placed behind the POS counter. This will invite customers in and direct them to the appropriate area to wait in line, in addition to adding flare to an otherwise crisp space. Previous articleWhat Are Encaustic Cement Tiles?